Each year I create reading lists for my girls. Those lists include what I call Mom’s Must Reads as well as additional titles the girls will enjoy. Mom’s Must Reads always includes Newberry Award winning books, Caledecott winning books, and selections of African-American literature. Their personal reading choices are based upon interest. This year’s Mom’s Must Reads includes books that have won the Coretta Scott King Award. 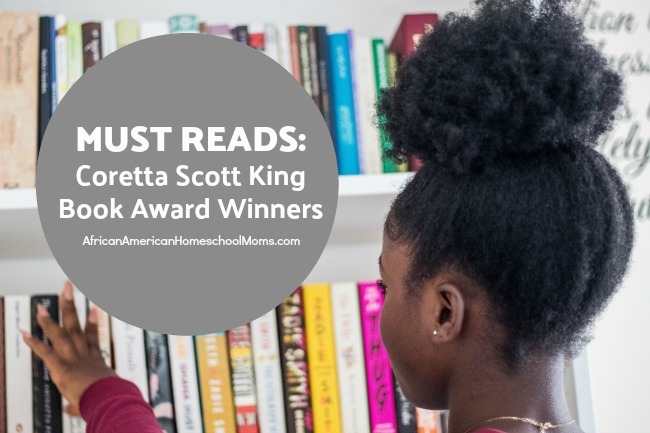 The Coretta Scott King Awards are presented once a year to African American authors and illustrators who create outstanding books for children and young adults. Each winning book reflects the African American experience. Coretta Scott King Author Award is presented to an outstanding author. Coretta Scott King Illustrator Award is presented to an outstanding illustrator. Coretta Scott King/John Steptoe Award is presented to a new talent in order to highlight excellence in writing or illustration at the beginning of one’s career. Coretta Scott King/Virginia Hamilton Award for Lifetime Achievement Award is presented to an African American author, illustrator or author/illustrator for a body of his or her published books for children and/or young adults and who has made a significant and lasting literary contribution. Previous Coretta Scott King Award winners include well known titles such as Bud, Not Buddy by Christopher Paul Curtis, Mufaro’s Beautiful Daughters by John Steptoe, Slam! by Walter Dean Myers, and In Daddy’s Arms I Am Tall by Folami Abiade. I love how the Coretta Scott King Award winning books span a variety of time periods and highlight various walks of life. The girls and I are going to have a great time reading and discussing these highly acclaimed books. For a complete list of Coretta Scott King Award winners, please check out this link from the African American Literature Book Club. What books by African American authors are on your child’s reading list this school year? Share your selections by leaving a comment below.